Camelopardalis (also Camelopardus) is named after the giraffe, what the ancient Greeks called the "leopard camel." Named in 1624 by Jacob Bartsch (1600-1633), he preferred to see it as a true camel, namely the one that brought Rebekah from Haran to Canaan to marry Isaac (Genesis 24:61). Each map can be clicked on to produce a 909x1199 version of it. They sport red labels, which look good on screen, but which disappear when used with red flashlights. Each map, therefore has a second link to a map better suited for printing in a graphics program, and using in the field. While they are quite large, they are all about 50-55k, and so are easy to view at today's modem speeds. The first map is a wide area view of the constellation, suitable for naked eye browsing. The next views are binocular width, showing stars to mag. 10, and labeling deepsky objects to magnitude 12. 47k Labeled JPEG NGC2655 (Best 11) is the western member of a pair of galaxies located in a barren region of the constellation near the Draco border. Owners of equatorial mounts will have an easier time of it moving 10.5° north from Rho Ursae Majoris. Dreyer describes it as very bright (mag. 11), quite large (4.9'x4.1'), and a little extended in p.a. 90°. Dreyer notes a pronounced core. Just visible in large binoculars, an 8" will show the bright core surrounded by a faint halo. How much of the halo you see is determined by overall sky darkness. Use averted vision. 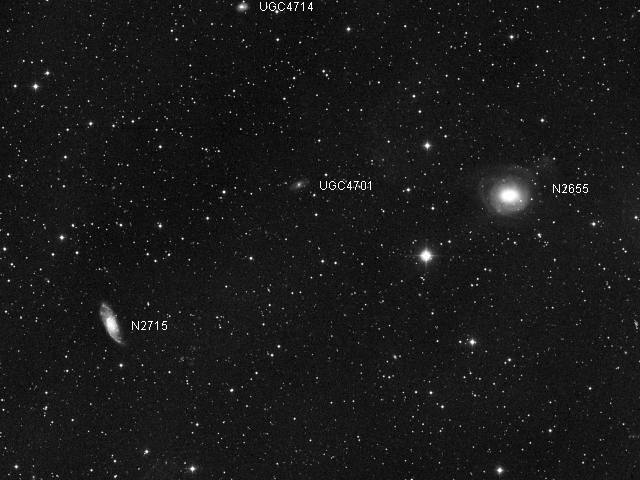 NGC2715 sits 39' to the east. Dreyer describes it as fairly bright (mag. 11.9), large (4.9'x1.7'), and extended (in p.a. 22°). Barely detectable in a 6", a 12" shows a nice, mottled, elongated galaxy at higher powers. Image from the Digital Sky Survey. 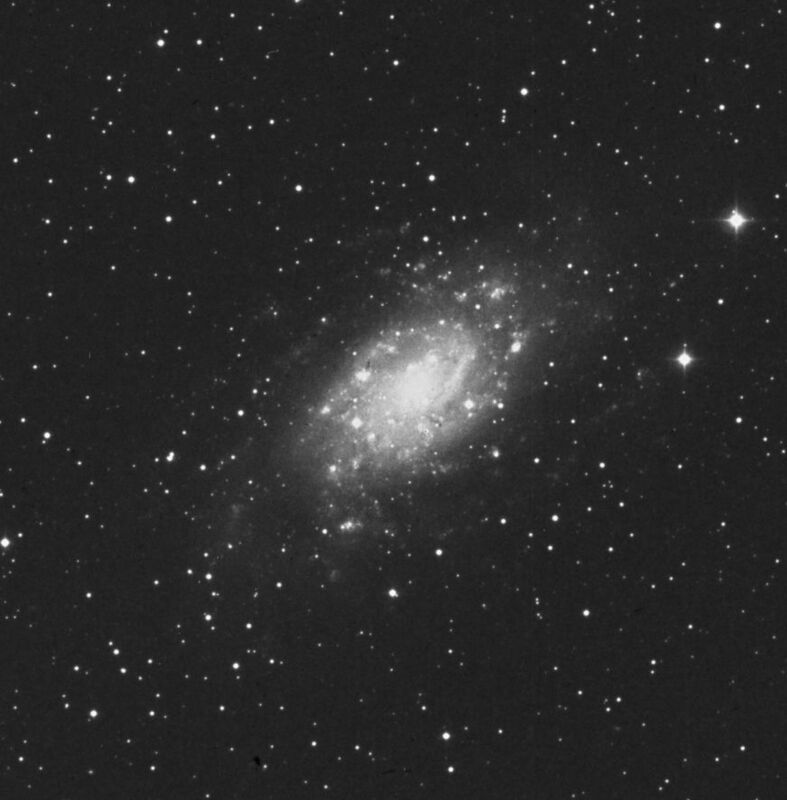 71k JPEG NGC2403 (Best 10, Caldwell 7) is a mag. 8.4 spiral galaxy located in the middle of nowhere in the far eastern Camelopardalis (it's labeled on detailed map 2). Dreyer describes it as very bright, extremely large (18'x10'), with a brightening toward the nucleus. From the Digital Sky Survey. 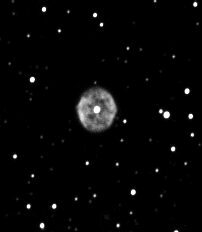 NGC1501 (Best 9) is a planetary nebula located on a line between Beta Camelopardalis (mag. 4.2) and SAO24054 (mag.4.3) in the south-west part of the constellation. 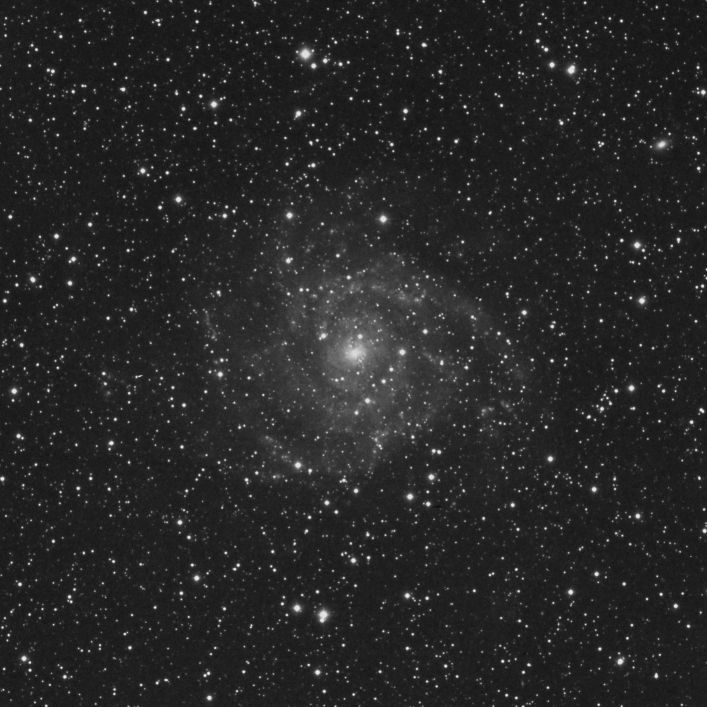 Dreyer describes it as fairly bright (mag.13), fairly small (1'), and very little extended (i.e. more or less round). This particular planetary does not respond well to "nebula" filters, consequently one needs dark skies to see it well. It begins to look mottled with high power in a 13", according to Steve Coe. The central star shines at mag. 14.5. 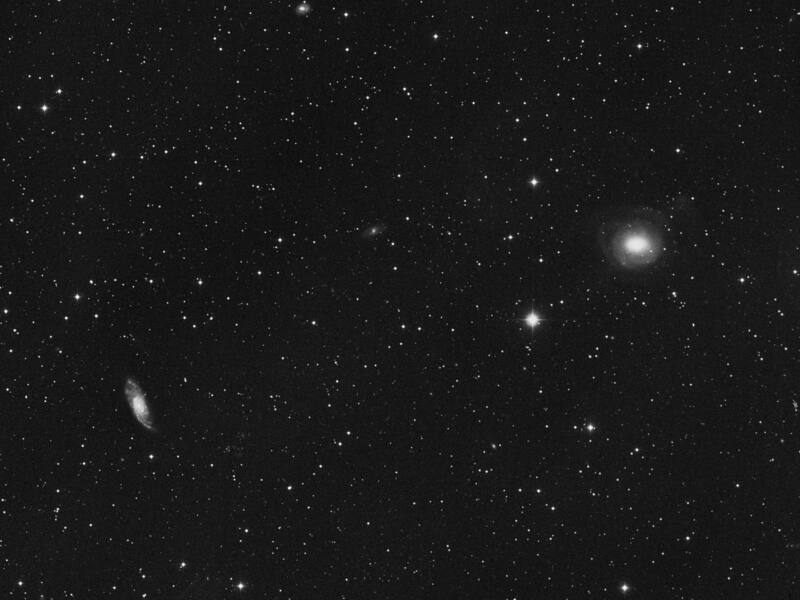 Image on the left is taken by George Normandin of the Kopernik Observatory. Image on the right is a drawing by Jere Kahanpää from observations made through an 8", f5 at 133x, using an OIII filter. 89k JPEG IC342 (Caldwell 5) is a spiral galaxy located 3.2° S of gamma Camelopardalis. Dreyer describes it as faint (mag. 9), very large (20'), round, with a sharply brighter core. From the Digital Sky Survey.